Published October 8, 2016, Mindie’s 6th book (and the 3rd in the Haunted Shore series), The Haunted Lower Eastern Shore is released. This is the 3rd book in a three-book series that covers many of the sites on the Chesapeake Ghost Walks. The Haunted Lower Eastern Shore includes the tales of Teackle Mansion and Poplar Hill Mansions, the old Princess Anne Jail, Firehouse Headquarters in Salisbury, The Pocomoke River and Forest, Snow HIll’s many mansions and inns, the Mar-Va Theater, McCready Hospital and more. 28 stories in all about spirits, hauntings and unexplained events in some of the most desolate, rural areas in Maryland. The stories follow many of the sites on the Princess Anne, Crisfield, Pocomoke, Snow Hill and Salisbury ghost tours. 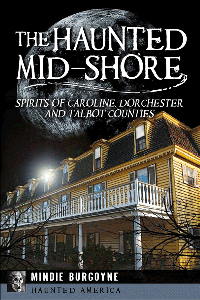 Publishes in July 2015, Mindie’s 5th book (and the 2nd in The Haunted Shore Series of 3), The Haunted Mid-Shore: Spirits of Caroline, Dorchester & Talbot Counties is released. This is the second book in a three-book series that covers many of the sites on the Chesapeake Ghost Walks. The Haunted Mid-Shore includes the tales of “Bloody Henny,” Mary’s Ghost at Old Salty’s, The Man Who Was Buried With His Dog, The Frenchman’s Oak, The Witches of Plain Dealing, Cannon’s Ferry, Maggie’s Bridge and Mindie Burgoyne’s personal account of her tour through the Denton Jail. 25 stories in all about ghosts that haunt some of the oldest Colonial villages and towns in Maryland. 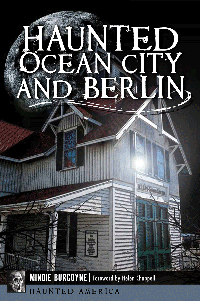 Publishes October 11, 2014 Mindie’s 4th book, Haunted Ocean City and Berlin was released. 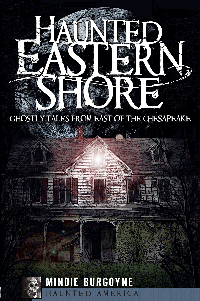 It was the first in a three-book series that covers many of the sites on all ten of the Chesapeake Ghost Walks. Haunted Ocean and City and Berlin features stories from the Ocean City Ghost walks including the Atlantic Hotel in Ocean City, the Ocean City Life-saving Station, the Henry Hotel, the Trimper’s Carousel and Dolle’s Candyland. From the Berlin Ghost Walk – Adkins Hardware, the Atlantic Hotel, the Ayers General Store, the Parran Lodge and the “healing tree” in front of the Calvin B. Taylor House are included. Besides those sites on the walk, Mindie covers the Dunes Manor Hotel, the Rackliffe House and Captains Hill. 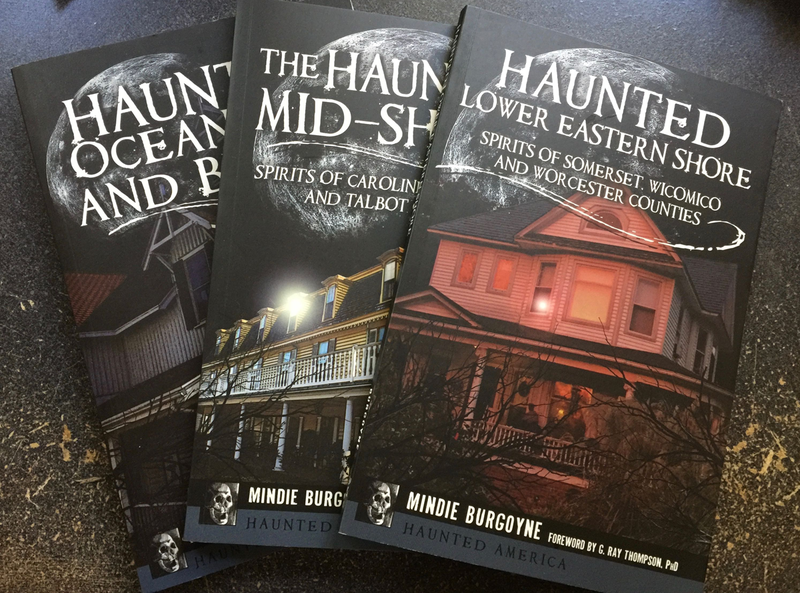 Mindie Burgoyne’s most popular book, Haunted Eastern Shore, Ghostly Tales from East of the Chesapeake was published by The History Press in 2009 and is now in its sixth printing selling over 10,000 copies. The book focuses on 23 sites known to be haunted in the nine rural Maryland counties. Mindie gives the historical background on each site, the tale about haunting or paranormal activity, and then tells what people say today. Many of the sites are public so readers can take the book on the road and see the sites up close. 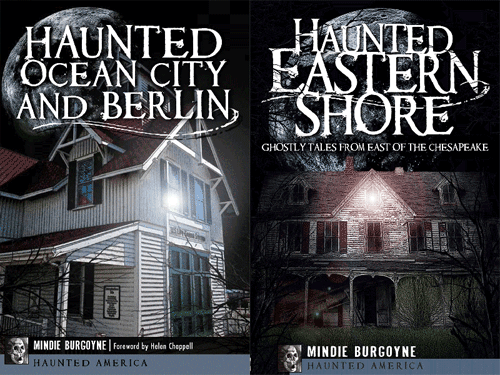 The Eastern Shore Haunted Series – 3-book Set – features three most recent books authored by Mindie Burgoyne. This are 70 stories covering the six counties of Maryland’s Eastern Shore plus a few Delaware stories (Woodland, Maggie’s Bridge & Cannon Hall). Plus, this set includes the story of the author’s own haunted house (shown on the cover of book 3) and her account of what led her to study and write about ghosts on the Eastern Shore. Signed by author, personalized if you wish and drop shipped directly to your intended receiver. Easton: Then and Now focuses on the historic Town of Easton which was once the Eastern Capital of Maryland. Photo images of Easton in the nineteenth century with captioned details are printed adjacent to a current image of the site with details about how the site has or hasn’t changed over the decades. Published by Arcadia Publishing in 2007. Snow Hill: Images of America focuses on the small Town of Snow Hill in Worcester County, Maryland which was once a significant port town at the headwaters of the Pocomoke River. Today it’s population is small and the town has become a emerged as a destination for eco-tourism, while keeping its historic charm. Over 100 historic images of the town are included in the book. Published by Arcadia Publishing in 2006. 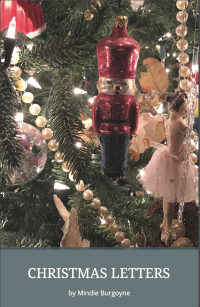 The ebook in pdf format is sure to put you in the holiday spirit, or perhaps help you with writing your own Christmas letter. Get your ebook instantly FREE when you sign up to receive the Travel Hag Newsletter (Mindie’s newsletter about travel) – or buy yours for $5.99 and read excerpts from the book on our product page. Sign me the FREE Chesapeake Ghost Walks e-newsletter! 4 books signed by author – Gift Certificates – Shop Now!